Kateri was born in upstate New York, the daughter of a Mohawk warrior. Her mother died of smallpox when Kateri was four and she was adopted by her two aunts and an uncle. Kateri had also contracted smallpox and the disease left her with a lingering illness and a disfigured face. During this time, the French Jesuits had undertaken an evangelization mission to the Indians. Kateri’s uncle, a powerful Mohawk chief, warned her against the Jesuit “Black Robes” whom he blamed for the sickness and disease which had fallen on the tribe. The girl’s experience with the Jesuits was quite different however. She found them to be kind and gentle and through their message, she felt called to Christianity. 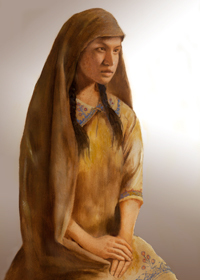 Converted as a teenager, Kateri was baptized at the age of twenty and dedicated her virginity to Jesus. She developed a great devotion to Jesus in the Eucharist and to the crucified Christ. Her conversion incurred great hostility among her tribesmen; but Kateri remained steadfast in her faith. She refused marriage which was considered the duty of Mohawk women in order to have a man who would provide food for the family. In 1678, Kateri’s confessor, Father Jacques de Lamberville, fearing for her life, sent Kateri to a new Christian colony of Indians in Canada. Here, Kateri lived a life of prayer, penance, and care for the sick and the aged. Each morning, even in the bitterest winter, she rose long before dawn and stood at the chapel door until it opened at four. She remained there until after the last Mass when she went into the fields with the other women of the community. When their work was done, Kateri returned to the chapel for her daily Rosary and evening devotions. On Sundays and feast days, Kateri often spent the whole day in prayer at the chapel. Still suffering the effects of her childhood sickness, Kateri died during Holy Week in 1680. Her last words were, “Jesus, Mary, I love you.” The story is told that at the moment of her death, the scars on her face disappeared. Kateri Tekakwitha is known as the “Lily of the Mohawks” and a book by that name was written about her life. Blessed Kateri Tekakwitha, beatified by Pope John Paul II in 1980, is the first Native American to be beatified in the Catholic Church. She is a patron of ecologists and environmentalists. We celebrate a Memorial to this saint on July 14. Kateri's message today: Imagine the strong faith that this young woman developed in her short lifetime. When the vast majority of her tribe and the members of her family were against her, she stood resolute in her determination to dedicate her life to Jesus. Is your faith strong enough to stand up to your acquaintances—perhaps even your family—when they try to discourage you?